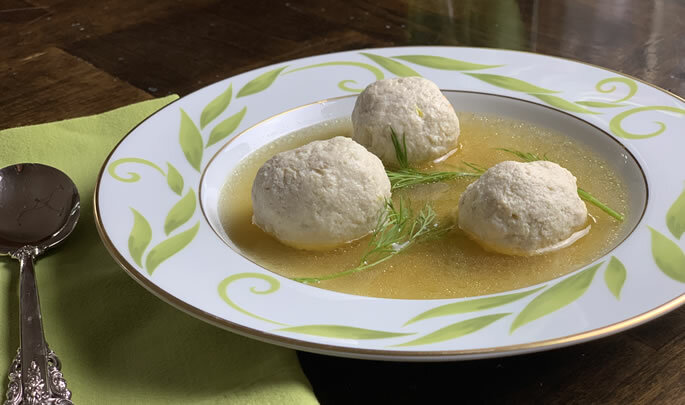 It may be a bit misleading to call these matzo balls, since they have no matzo in them, but they look just like matzo balls, are very tasty and good for you too. In a medium bowl mix together the chicken, stock, ground almonds, coconut flour, garlic, egg, oil, salt, and pepper. I like to use my hands. Cover with plastic wrap, and chill for 2 hours or up to 1 day. Have a bowl of cold water nearby; wet your hands, scoop up some batter shape into 1 ½-inch balls. Place onto a plate and place in the fridge until the water is boiling. Bring the water to boil over high heat and add the kosher salt. Add the matzo balls, reduce heat to simmer and cook for 8 minutes. Serve with soup. Place the chicken pieces in a large pot. Add the onions, carrots, celery, garlic, parsnip, fennel, mushrooms, bay leaves, and salt. Add the water and bring to a boil. Use a large spoon to skim the scum off the top of the soup. Add the peppercorns and salt. Cover the pot, reduce the heat to low, and let the soup simmer, checking after 5 minutes and skimming off any additional scum. Add the parsley and dill, cover, and simmer for 2 hours. Let cool. Strain through a large sieve. Taste the soup and add more salt or pepper if necessary.